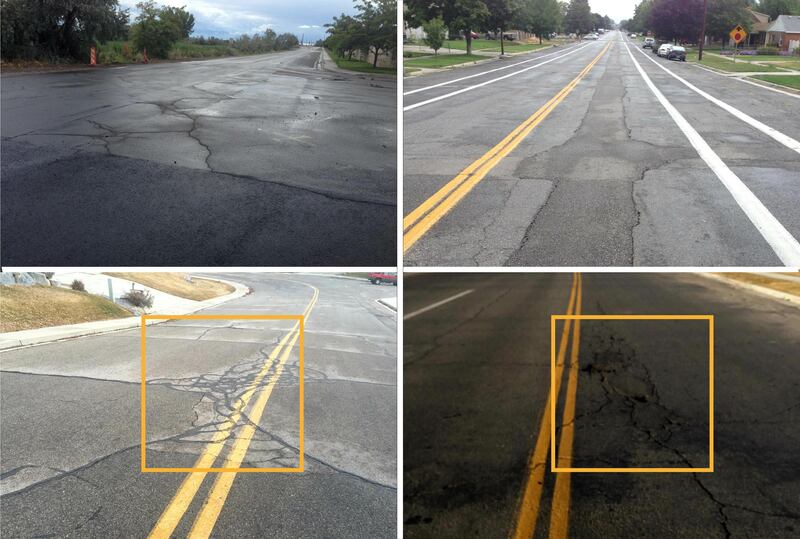 Redesign Paving will be done on all areas that contain more than 6 linear feet of cracks in any 4 square foot area. Existing asphalt pavement shall be heated without overheating to allow hot-in-place recycling of 2 inches in depth. a. To help control rutting rejuvenating agent will have a Viscosity of 20 centistokes or greater at 40 Degree Celsius. b. To help control thermal cracking rejuvenating agent will have a Pour point of -20 Degrees Celsius or below. 2. Makeup asphalt. 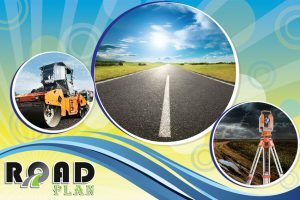 New hot mix asphalt or RAP with an oil content percentage of 4% or greater shall be added as necessary to bring compacted patch to level of the existing roadway. 3. Sealcoat. 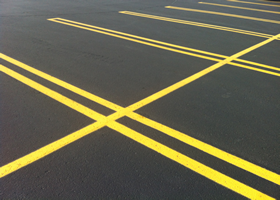 Sealcoat shall be Diamond Roads Gilsonite sealer or approved equivalent. 4. Equipment shall include but not be limited to shovels, rakes, lutes, hand torches, hot boxes containing RAP or virgin asphalt, in-place-heaters with and without screeds, brooms, hand and vibratory reversible plate compactors, sealcoat sprayer, rejuvenator heater and sprayer, mechanical brooms, hand laydown boxes, ten foot level, asphalt fines separator, and other necessary equipment to recycle asphalt. 2. Joint between newly recycled asphalt and existing roadway surface shall be angled at an angle of 45 degrees. This will reduce or eliminate water penetration into the joint and eliminate low compaction areas in the joint. 3. The asphalt pavement surface shall be heated for a minimum of 6 minutes. If the contractor is unable to recycle to a depth of two inches and can demonstrate that the pavement has been heated for 10 minutes with the surface temperature remaining between 150 to 200 degrees Celsius, a recycle depth of 1.5 inches will be acceptable and receive full pay. 4. 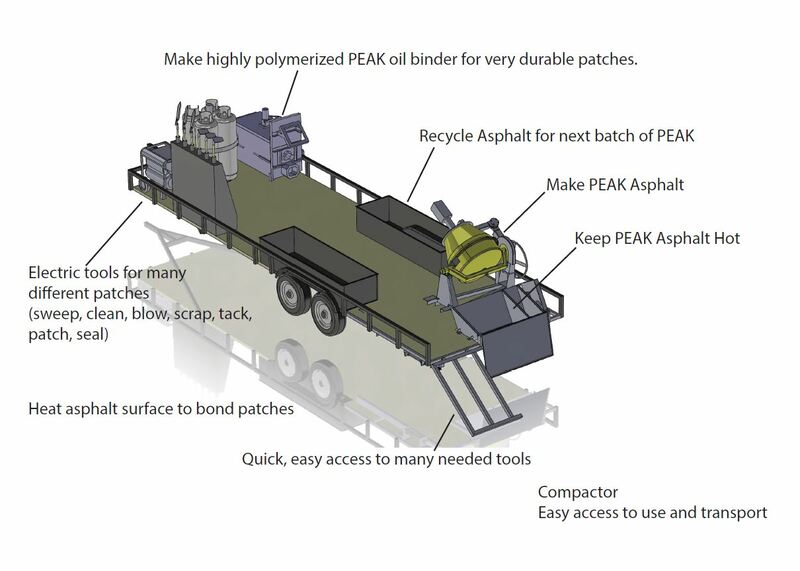 Rejuvenating oil shall be added at a rate of ¼ percent to ¾ percent oil by weight of the recycled asphalt. Total oil content plus rejuvenating oil shall not produce a recycled asphalt pavement with a void content of less than 3% at 100 % compaction. Pay shall include all equipment and materials to accomplish asphalt recycling as per the specifications.